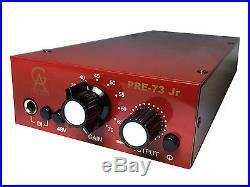 Golden Age Project PRE-73 JR Microphone Pre-Amplifier. It uses the same discrete (no IC´s) signal path with a transformer balanced in- and output. In order to be able to offer this classic and musical sound character at an even more affordable price point, we did scale down on some features. All the things needed for making great sounding recordings are there and the smaller format makes it possible to mount four units in our 19-inch rack kit, the UNITE MKII. No integrated circuits are used. GAIN switch range 20 - 70 dB. Switchable phantom power and absolute phase. A high-impedance instrument input for any sound module, electric guitar or bass. A simple signal LED indicator. The output level control makes it possible to make fine gain adjustments and also to overload the main gain stage for more character and then lower the signal to a suitable level before the output stage. Combo XLR/TRS input jack and separate output XLR and TRS jacks for flexible connections. Insert jack for inserting EQ´s and other units. The circuit board is prepared for the Carnhill input transformer. External power supply to avoid interaction with the audio circuits and transformers. A solid build quality that will last many years of normal use. The item "Golden Age Project PRE-73 JR Microphone Pre-Amplifier Preamp" is in sale since Sunday, April 03, 2016. This item is in the category "Musical Instruments\Pro Audio Equipment\Preamps". The seller is "micsdirect" and is located in Redhill. This item can be shipped to United Kingdom, Ireland, Germany, France, Austria, Belgium, Bulgaria, Croatia, Czech republic, Denmark, Estonia, Finland, Greece, Hungary, Italy, Latvia, Lithuania, Luxembourg, Netherlands, Poland, Portugal, Romania, Slovakia, Slovenia, Spain, Sweden, Australia, United States, Canada, Brazil, Japan, New Zealand, China, Israel, Hong Kong, Norway, Malaysia, Mexico, Singapore, South Korea, Thailand, Chile.